Source: U.S. Census, 2012-2016 5-Year Estimate American Community Survey. Cost Burdened is defined by the U.S. Department of Housing and Urban Development (HUD) as paying 30% or more of gross income on housing cost. Source: 1) U.S. Census, 2014 1-Year Estimate American Community Survey. 2) U.S. Census, 2014 5-Year Estimate American Community Survey. Households paying more than 30% of their gross income on housing are considered cost-burdened. Cost-burdened households may have difficulty affording necessities such as food, clothing, transportation, and health care cost. 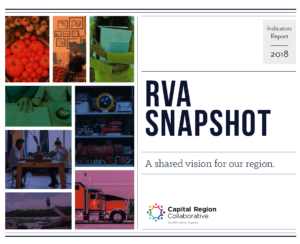 In the Richmond Region, cost burdened households have increased from 32.2% to 32.9% since 2014.